*Nutrition information is a rough estimate calculated without additional sauces or toppings (i.e. chutney), but calculated with the suggested oil (in this recipe and the curried lentils). If you remove the oil the nutrition comes to ~390 calories, 4.7 g fat, and 3.7 g saturated fat. I enjoyed this recipe very much. I’ve shared it with many. I had leftovers at work, and everyone said how great it smelled. My question is, why is the calorie count so high? I used light coconut milk, which is only 40 cal. per 1/4 cup. Lentils are lo-cal. Is the calorie count reflective of the recipe with regular coconut milk, maybe? Just wondering. I can’t believe how delicious this is! The curry lentils are simple and savory. Add with the sweet potatoes- so delicious. But then you add that cilantro chutney- and it’s shut-the-front-door-fantastic!!!! I love your recipes. I love that I found this website. 5 Stars!! 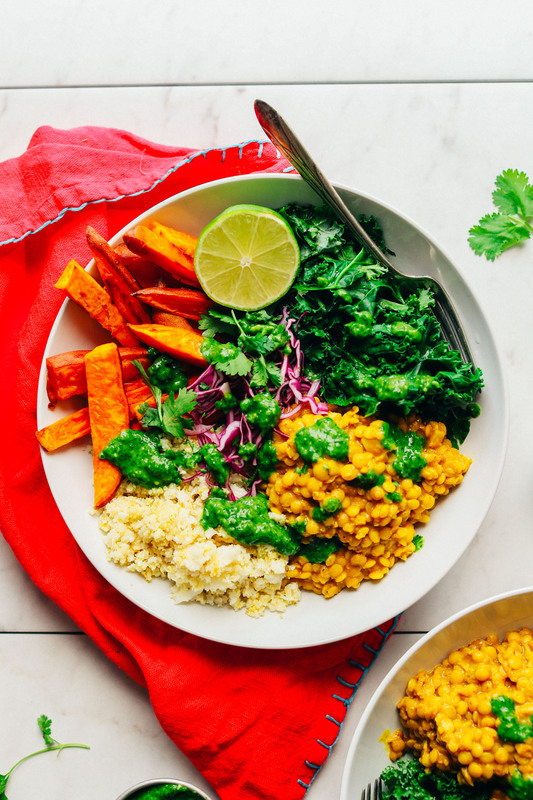 Will red lentils work as well as golden lentils? Hi Taylor! We haven’t tried it, but one other reader has and had success with it! If you try it, let us know how it turns out! I grew up hating sweet potatoes (they made me gag). However, this dish was very good, and I enjoyed how the sweet potatoes complemented the dish. Bravo!! Beautiful colorful meal! This was the perfect meal to prepare before yoga tonight, cane home to a yummy nourishing dinner ✨ I made everything except the cauli rice, went with basmati, I’ll make the cauli rice next time! 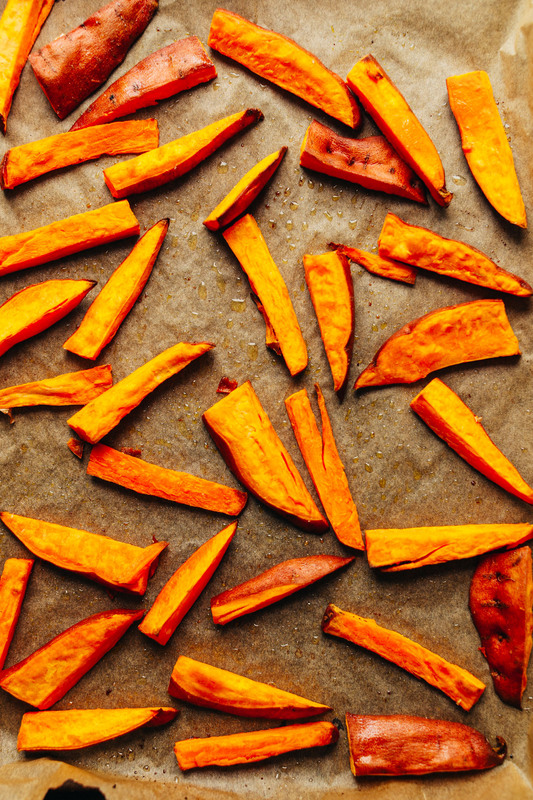 Adding thise sweet potato wedges to my roasted veggie repertoire. The chutney was amazing and it came together so quickly! I’m going to make this my weekly post yoga dinner ?? Thank you!! This is superb! I love it nad want to have this everyday. You are so talented! Keep it up! Great post! What social share icon plugin are you using? Thanks from Vancouver Canada! 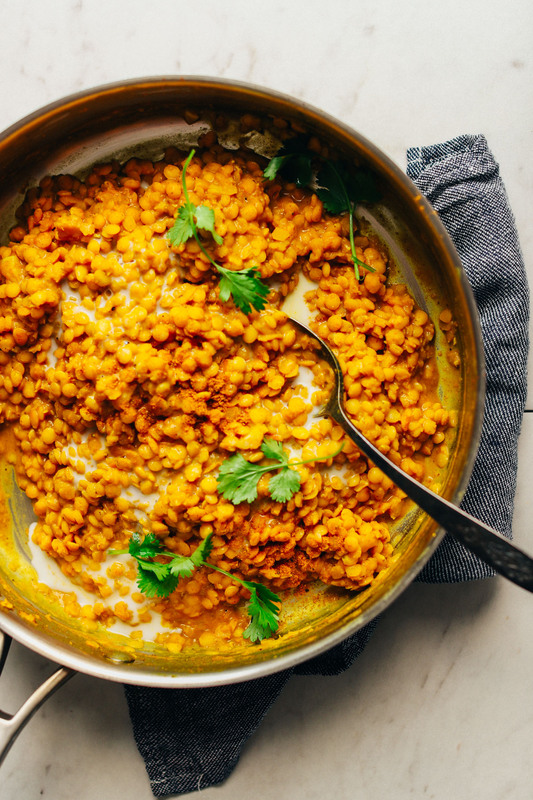 Lentils and rice are one of my go to comfort meals (quite popular in India), and this took it to the next level! So delicious! Followed the recipe mostly as written. The lemon in the lentils is key! Thanks Dana! Made this dish in its entirety tonight including the cauliflower rice and chutney (Wow!)! Turned out great! I used red lentils and maple syrup which worked well. Also full fat coconut milk – warming and filling on a cool fall evening. Found local ginger to boot! Thanks so much!! So delicious! Everyone should go run to make and then promptly eat this right now. Thank you for always making me look good Dana. I know I will impressive friends and family and convicnce people that going vegan is doable if I make one your recipes! hi! making this recipe now, can’t wait to try! if i am using sotre bought riced cauliflower (trader joes) how much should i use? thanks! This looks like such a perfect recipe! Curried beans have been one of my obsessions lately. Combining them with sweet potatoes and a delicious sauce works so well too! I made this last night and it was amazing! 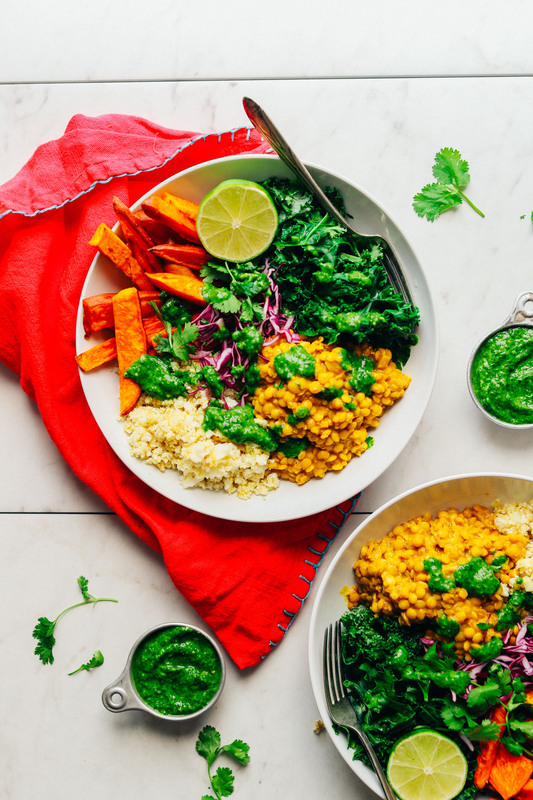 The lentils have got to be my favorite new dish—the simple but flavorful sauce is positively delicious! I substituted whole grain jasmine rice for the riced cauliflower, but otherwise made the recipe as suggested. There’s plenty left over for lunch today and I’m excited to eat the leftovers! Hi, this sounds delicious!!! 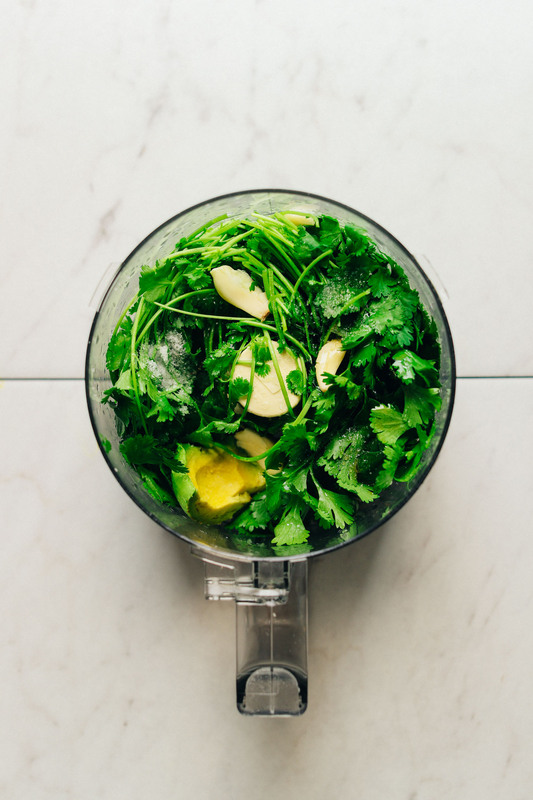 One quick question, the picture of your cilantro chutney seems to have avocado which is not listed among the ingredients. Am I mistaken? Is it optional? 10/19/17 I prepared this today. It is a SPOON-BANGER x 10!!!! Outstanding recipe. I made each part of the recipe exactly as written. Each part was exquisitely seasoned. All the elements put together was visually striking, and tasted like something from a high-end gourmet chef. Dana, you rock! I have made many of your recipes and everyone was delicious and easy. You are a blessing in our lives. Thank You!! Yay! So kind. Glad you enjoyed it! Hi! Keep up you’re amazing work! 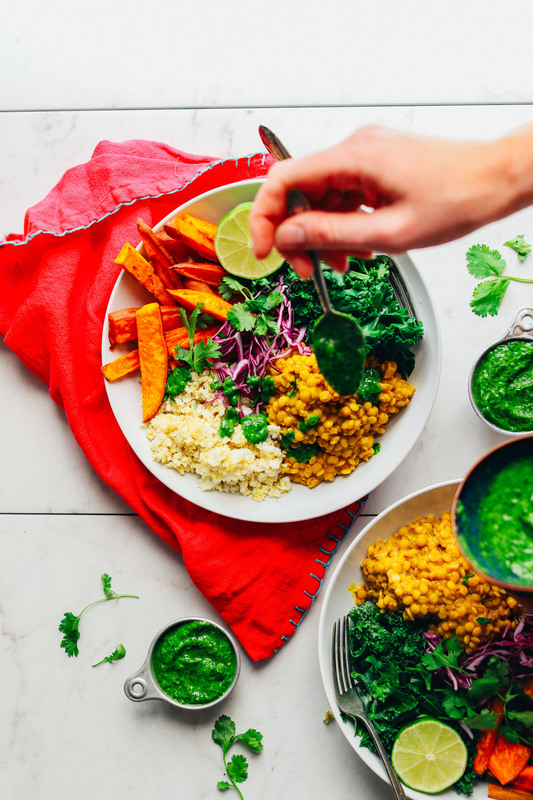 It’s great for encouraging more of us to go vegan….imagine the massive positive effective you have on saving animals and global worming- by your awesome alternative way of cooking- genius!! Well done you…it’s the best thing I’ve seen on the web! I have tried many of your recipes, and each one is better than the last! Yes, I did buy your cookbook too, and have been telling all my friends they need it too. 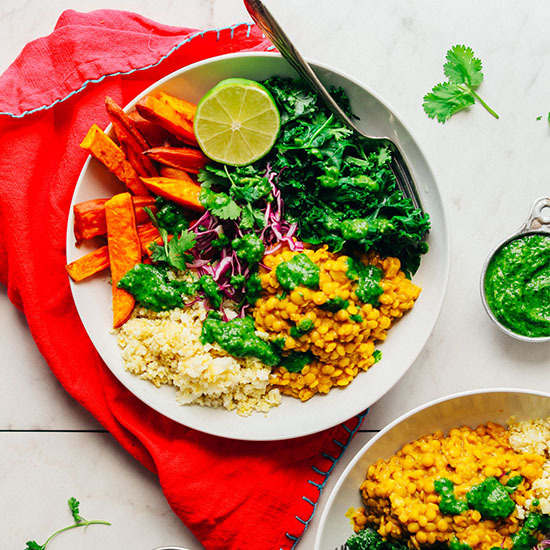 Yesterday we made your One Pot Kale & Sweet Potato Curry. It was unbelievably tasty. Thank you for providing such healthy, tasty recipes for us! AND… the colours are gorgeous! Food for the eyes! I shall try this soon! I love your website! Thank you! Super healthy & super beautiful at the same time!! I can only imagine the flavor! !